Description: Comes in a case shaped like a book and includes a 44 page art book. Box Text: A story of mercenaries who long to become knights. The mainland of the Empire slides inexorably into ruination, yet one place endures against the tide of decay - Lazulis Island. Zael comes to this last bastion of prosperity with his friends dreaming of knighthood and fame, but instead stumbles upon a mysterious power and a beautiful stranger that catapult him into an adventure beyond his wildest dreams. Take control of the battle in real-time. - More freely on the battlefield. - Exploit the environment to your advantage. - Use Zael's Gathering ability to draw enemy attention. - Dispel allies' magic for addition effects. - Command up to a party of six. Fight with 2-6 online players in Deathmatch, or team up with friends to take down a boss in Co-op. 08-21-2012 scott Description Comes in a case shaped like a book and includes a 44 page art book. 08-21-2012 scott Box Text A story of mercenaries who long to become knights. The mainland of the Empire slides inexorably into ruination, yet one place endures against the tide of decay - Lazulis Island. Zael comes to this last bastion of prosperity with his friends dreaming of knighthood and fame, but instead stumbles upon a mysterious power and a beautiful stranger that catapult him into an adventure beyond his wildest dreams. Take control of the battle in real-time. - More freely on the battlefield. - Exploit the environment to your advantage. 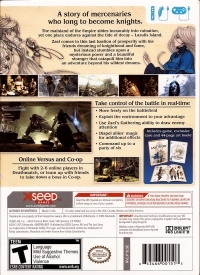 - Use Zael's Gathering ability to draw enemy attention. - Dispel allies' magic for addition effects. - Command up to a party of six. Online Versus and Co-op Fight with 2-6 online players in Deathmatch, or team up with friends to take down a boss in Co-op. This is a list of VGCollect users who have Last Story, The - Limited Edition in their Collection. 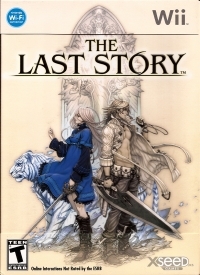 This is a list of VGCollect users who have Last Story, The - Limited Edition in their Sell List. 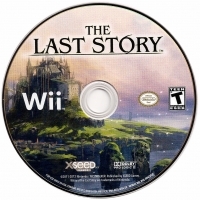 This is a list of VGCollect users who have Last Story, The - Limited Edition in their Wish List.